Wales number eight Taulupe Faletau is set to miss the Six Nations after again breaking his arm. 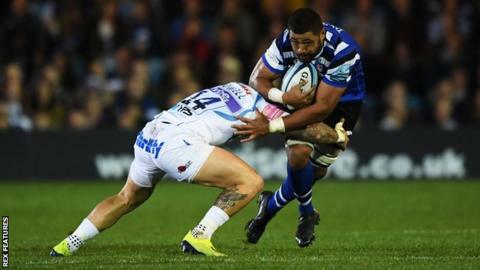 Faletau suffered a fractured forearm playing for Bath in October and missed the autumn international series. The British and Irish Lion, 28, made an impressive return in Saturday's 18-16 Champions Cup win over Wasps but it has emerged he has suffered another break. Faletau is expected to be out for up to eight weeks, so has a slim chance of making the final round on 16 March. Wales begin their campaign away to France in Paris on 1 February and Faletau's injury adds to Wales' back-row headaches, with Lions flanker Dan Lydiate set to miss the start of the tournament after suffering a biceps injury in November. Aaron Shingler's knee injury means will not return until March at the earliest, while Ellis Jenkins is ruled out of the tournament with the serious injury to his knee that he suffered against South Africa in November. Ross Moriarty has not played since suffering concussion on 15 December and Dragons have confirmed he will not face Clermont Auvergne in the European Challenge Cup on Friday, 18 January. But it is hoped the 2017 Lions tourist will return for the Dragons when they host Munster on Saturday, 28 January, six days before Wales start their Six Nations campaign. Josh Navidi missed the autumn Tests with a knee injury and could be a number eight option in the Six Nations alongside Moriarty and Seb Davies, who started against Tonga in November. Aaron Wainwright and Justin Tipuric are Wales' fit back-row options, while Wasps flanker Thomas Young has impressed in the English Premiership and Ollie Griffiths has also played at number eight for the Dragons. Wales coach Warren Gatland will announce his Six Nations squad at midday on 15 January.